When it comes to performance modifications, bushings can be a little weird. Bushing performance isn’t necessarily measurable, rather, it is felt. Proper bushings help control drivetrain movement and maintain proper caster and camber alignment. In a natural progression, the 2015 Mustang S550 platform is equipped with an independent rear suspension across the entire vehicle line. A known problem with IRS is wheel hop. In some cases, like the S550 Mustang, bushings can reduce wheel hop which can be detrimental to its performance at the drag strip or on the track. Energy Suspension has created a complete kit of polyurethane suspension bushings for the S550 Mustang. The kit includes the front and rear control arm bushings (PN 4.3170, PN 4.3166), front and rear sway bar bushings (PN 4.5200, PN 4.5198), rear differential mounts (PN 4.1139), and subframe mount set (PN 4.4122). According to Energy Suspension, Hyper-Flex polyurethane bushings will stiffen the suspension but remain compliant enough for daily driving. Unlike rubber, the polyurethane bushings won’t wear down or deteriorate from sun exposure or due to under-the-car chemicals like oil and coolant. 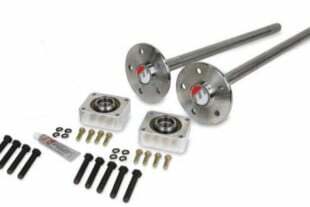 The kit is available to purchase through aftermarket part dealers like Steeda and American Muscle. To install the Energy Suspension bushings, the driveshaft needs to be removed as well as the brake calipers, exhaust, and other components so the entire IRS can be removed from the car so the suspension components are accessible. The subframe bushings from Energy Suspension are made from polyurethane which is what makes them more durable than the OEM rubber mounts. Replacing the stock rubber bushings will reduce bushing deflection and improve performance with firmer differential mount bushings. Remove the stock rubber bushings from the cradle. The Energy Suspension urethane bushing halves are an easy fit into each of the four mounting holes for the cradle. The inner steel sleeve is an easy press-fit by hand into the cradle bushings. The bushings are pushed together with the inner steel sleeve in the middle. Repeat the process for all other mounting points. Both ends of the upper camber link get new bushings. Installation begins with the outer steel sleeve press-fitted into place and then covered with the bushing and supplied assembly grease on the link. The next IRS component to receive the urethane bushings are the integral links. With the sleeves in place, press-fit a urethane bushing into position in the integral link. Use lubrication grease on the inner sleeve and then press-fit into place inside the bushing. To install bushings on the H-arms, the urethane bushing needs to be carefully set into position before being press-fitted. The inner sleeve is then pushed into place in the bushing. The center bushing fits into the opening on the H-arm, while the end piece fits on the bottom. The center bushing is then pressed into place in the H-arm with another end piece on top. All three pieces of the bushing are then pushed together with the inner steel sleeve in the middle. Once the stock bushings are removed from the cradle mounting points that hold the differential centersection in the cradle. The bushing, sleeve, bolt, large washer, and small washer, are installed with a nut and washer tightened securely on the other end. These front control arm bushings for the 2015 Mustang help maintain proper alignment under extreme conditions and improve vehicle handling, cornering and overall control. Full floating and non-binding design for smoother, efficient operation. The Energy Suspension bushings come with an outer steel sleeve and inner sleeve. The outer sleeve press-fits into place, similar to the bushings in the IRS, with a preset measured amount sticking out of the arm. Using plenty of bushing grease throughout, installation of the front lower arm bushings is completed by pushing the second outer bushing into position. The Energy Suspension polyurethane sway bar bushings allow the sway bar system to work correctly which dramatically improves the handling characteristics of the Mustang. The bushings are made of Hyper-Flex polyurethane which allows for periodic greasing and they last longer than OEM rubber bushings. At each end of the car, the sway bar needs to be removed. The stock rubber bushings have been glued on the bar, so they need to be removed from the bottom metal bushing mount. If they don’t come off completely, Energy Suspension recommends use of an X-acto knife to cut the remaining material off the bar. The metal brackets can be reused with the new urethane bushing, though some clearance work might be needed. With plenty of bushing grease, reassemble the sway bar and reinstall in the car. For more install information, see Energy Suspension.